If you ever feel nostalgia for simpler times, when there were fewer distractions and less crime, then this century-old advice to tourists will sweep it away. Apparently, London was nothing but a series of traps for the unwary; only Enquire Within Upon Everything stood between them and ruin. 1. Before starting on your holiday spend two hours in studying a good guide-book and mapping out a programme for each day of your stay in London. Note that some institutions, as the British Museum, are open free every day; some, as the National Gallery, are open free on certain days and for a fee on others; some, as the Mint and Woolwich Arsenal, are open on specified days and under stringent conditions. 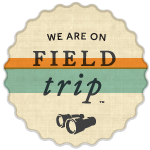 These things should be ascertained from the guide-book before leaving home, and your programme modified accordingly. 2. Group the sights so as to economize your time. For example, avoid such a programme for a day's doings as this - the Tower; Tate Gallery; Madame Tussaud's; Greenwich Hospital; Hyde Park. To "do" these sights in a day would put a great deal of time to waste. 3. Ask your way of a policeman, postman, telegraph boy, or shopkeeper. If you are in a residential quarter, you will be compelled to resort to the courtesy of the casual wayfarer; but in that case take the direction from him and then pass on. 4. If you feel that you are taking the wrong road, do not proceed farther until you have ascertained whether you are right or wrong. You have a civil tongue; do not hesitate to use it. 5. If a stranger get into conversation with you in a gallery, or church, or the street, make himself particularly affable, claim that he thinks he has met you before or that he comes from the same town or district as yourself, be on your guard instantly. If further he be joined, apparently by chance, by a friend or two and propose to adjourn for a drink or a meal, and then talk of his prospects and the money he has, and ask you to lend him, for a short while, your purse, or an article of value, merely to show your confidence in him - he having already shown his confidence in them by handing some article to his confederates - be sure you are in the company of "confidence trick" rogues and leave them at once. If you happen on a policeman near by, describe the men to him and tell him where you left them. The information may be useful to him. Avoid all talk with undesirable or promiscuous folk whose appearance and manner you do not care for on acquaintance. 6. As to tips, at many establishments where only a light repast is served "no gratuities" is the rule. Otherwise the custom is to tip the waiter on the scale of 1dfor every shilling of your bill. Thus if your dinner cost 2s. 6d., the waiter's tip would be 2d. or 3d., whichever you please. 7. For a short stay it will answer your convenience and save time to put up at a comfortable central hotel rather than lodge in a suburb. 8. Arrange your programme so as to leave the evenings free for the theatre, or music hall, or concert, or the fireworks at the Crystal Palace. Related post: London sightseeing, when did it get so slow? 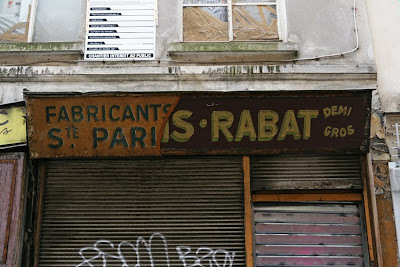 Here's some more faded Paris: a shop front on rue au Maire. 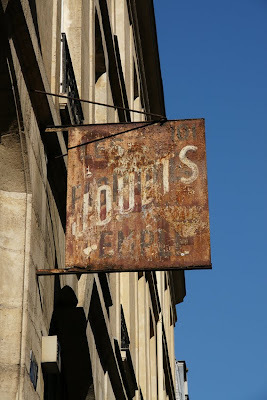 This rusted, faded metal sign on the rue du Temple declares that number 101 was once les fabriques jouets du Temple (the toymakers of the Temple). 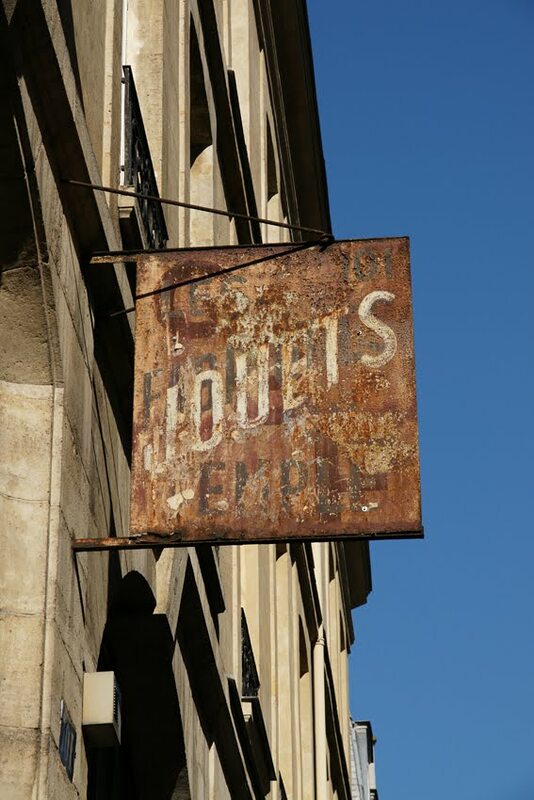 Although it's not strictly a ghost sign, as it isn't painted onto a wall, the textures and muted colours speak appealingly of its long service above the street. Today, the building contains not a factory but an importer of, among other goods, toys. A chance listing on Abebooks alerted me to the existence of an intriguingly-named group who met in eighteenth-century Deptford. While I didn't buy the book (a sermon isn't really my taste), I did explore further who these Ubiquarians were. In the eighteenth century, societies for middle and upper-class men were enormously popular. In fact, the problem was not so much finding a society to suit your tastes as finding enough members for your society! They ranged from learned societies to the notorious Hellfire Club. The Ubiquarians were part of this fashion, at the more respectable end of the spectrum, and shared many of the features of similar organisations. Like many such societies, the Ubiquarians pretended to have a long and venerable history. Their book of statues was preceded by 'a Preamble concerning the Antiquity, Universality, Fall, and Renovation, or Re-Institution of Ubiquarianism'. The society met weekly in the 1730s and 1749s, and also had a sermon preached to them at St Paul's Deptford in late June each year. These included several on the theme of friendship, including 'The practice of religion and virtue the only sure foundation of friendship' and 'The duties and offices of friendship' in 1738 and 1739. In 1740, the topic was 'The faith and practice of a Christian the only true foundation of rational liberty'. Like most such organisations, the Ubiquarians eventually faded away. They have left little trace except an intriguing name to catch the eye of later historians. I don't often walk along Comet Street, off Deptford High Street, but did today and was rewarded with this sign. It's one of several air raid shelter signs in Deptford, survivals from the Second World War. Others are on the High Street and Frankham Street (below), while Transpontine has spotted one on Tanners Hill. If you're suffering Deptford X withdrawal symptoms, then Trevor Burgess's new exhibition may be just the antidote! He lives and works in Deptford, and his current exhibition A Place to Live runs until 29 October at the Paul McPherson Gallery in Greenwich. 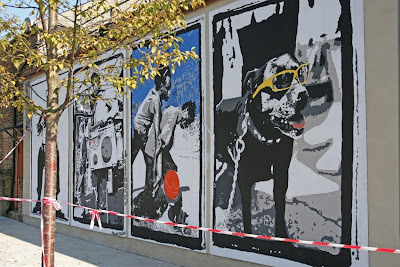 It features scenes of urban life in streets, markets and shops. There is also a new series painted on plywood, which is inspired by newspaper property adverts. 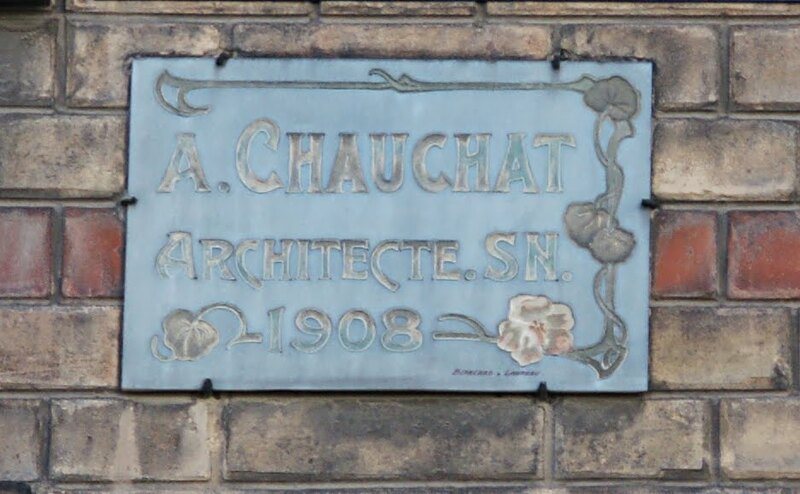 I’ve discussed before the practice of Parisian buildings displaying their architect’s name and date of construction. 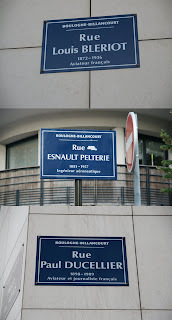 This plaque in Boulogne-Billancourt has to be one of the most attractive examples. The date is almost unnecessary, given the Art Nouveau flourishes of leaves and flower surrounding the distinctive script. 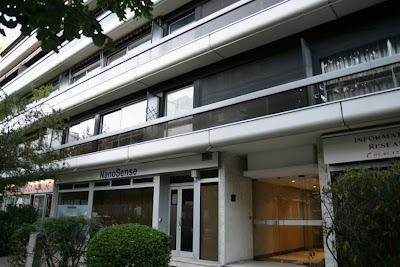 Sitting towards the western edge of Paris, Boulogne Billancourt is probably experienced by many of its visitors as a place of cheaper hotels and good Metro connections to the centre. However, it has its own history which is worth exploring. One aspect of that is the role of this area in the early history of aviation. 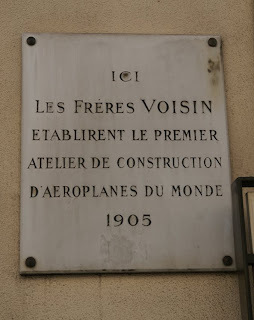 A few doors down from my hotel, a plaque marked the site of the Voisin brothers’ construction workshop, the first commercial aeroplane factory in the world. They established it in 1905; today the site is a block of flats. Charles and Gabriel Voisin had started their aviation experiments in 1900 with gliders. Gabriel had also worked with Ernest Archedeacon, Edouard Surcouf and Louis Bleriot before entering into partnership with Charles. By 1907 they had sold ten machines, the first manned, engine-powered, heavier-than-air craft capable of sustained and controlled flight. One of them, flown by Henry Farman, won the Deutsch-Archedeacon prize for the first complete one-kilometre circuit. 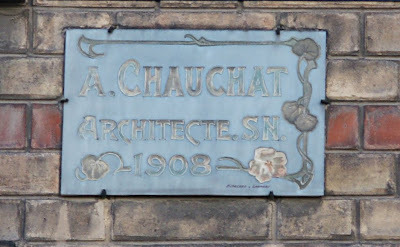 This growing success continued after the death of Charles in 1912; a few years later, the business expanded in a new direction when the French government bought their planes for use in the First World War. After the war ended, Voisin moved into luxury automobile manufacture and enjoyed further success. A short walk away, another block of flats has replaced the workshops of Edouard Surcouf which made not aeroplanes but airships. Surcouf had first flown in a hot-air balloon in 1879; he began his aviation career a year later, aged 18. Having inherited his father-in-law’s business in 1899, he gave it his own name and pioneered various innovations in airships such as the use of rubberised fabrics. In 1908, Surcouf’s business merged with Henri Deutsch’s Astra to form Surcouf-Astra. Like the Voisins, Surcouf-Astra won government contracts in the war: they supplied airships and observation balloons. However, business would then tail off as commercial aviation made its move away from airships to aeroplanes. Today, the main reminder of the area’s pioneering past is a selection of aviation-themed street names. Airship image: Surcouf's 'Ville de Paris', 1906, from Wikimedia. 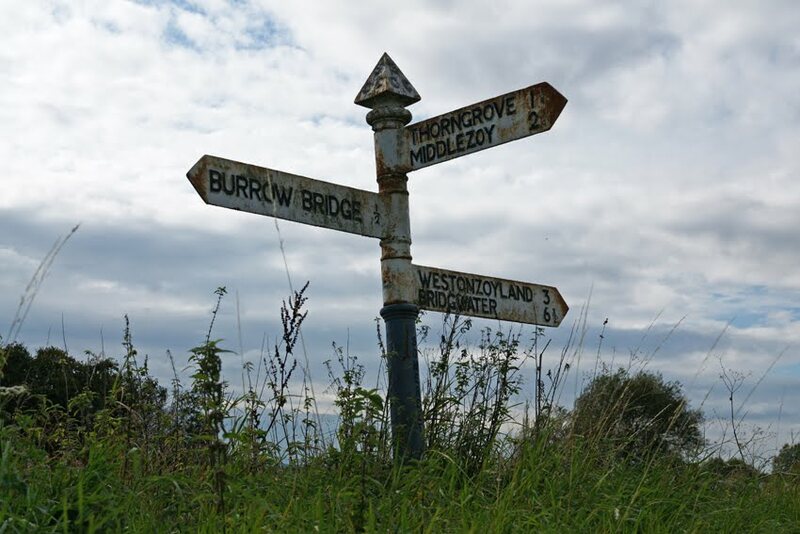 On the Somerset Levels, many traditional cast-iron fingerpost signs remain in use. They have a pyramid-shaped top with the initials ‘SCC’ on each side. Just visible on the grey central post is the word ‘Somerset’ descending vertically. Fingerposts have a venerable history. They date back to the seventeenth century, while legislation mandating their use on turnpikes was passed in the 1760s and 1770s. Somerset’s examples are generally around a century old: responsibility for signs was passed from cycling and motoring organisations to local authorities in 1903. Although the black lettering on white ground conforms to standards imposed in 1933, the grey post used in Somerset does not. The county continued its gentle subversion by resisting encouragement to replace the fingerposts with standard signs in the 1960s. This example is a little the worse for wear. However, it is still legible with its fingers pointing in the right directions, and adds to the character of its location. Whatever the benefits of standardised road signs, these distinctive characteristics are also valuable components of the local landscape. It is therefore praiseworthy that Somerset repairs and maintains these fingerposts rather than replacing them with more modern, less characterful versions. Click here for more signposts from this (very) occasional series. 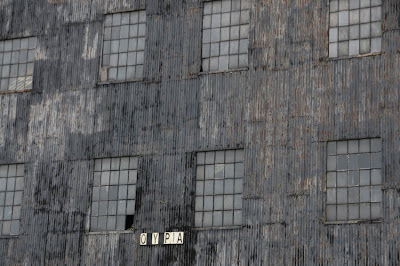 Olympia Warehouse in the former Deptford Dockyard has the distinction of being Grade II listed. Its exterior will certainly appeal to lovers of industrial heritage and corrugated iron, but the reasons for listing it may not be obvious at first sight. Built in 1846 by George Baker & Son, it is of distinctive iron-framed construction: the original wrought- and cast-ironwork is still visible inside. Originally, the two spans covered slipways, allowing ships to be constructed within. 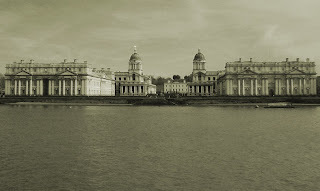 They led into the dockyard basin (now filled in) rather than directly into the river. 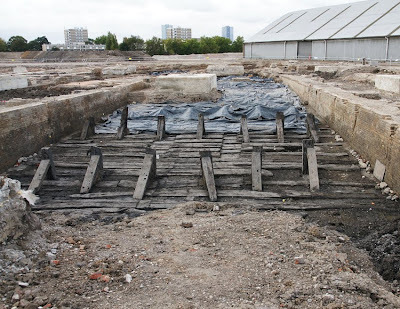 While the building now has a concrete floor and its more recent use was simply as a warehouse, the slipways are intact a little below current ground level. Only one other such shipbuilding shed survives, at Chatham. 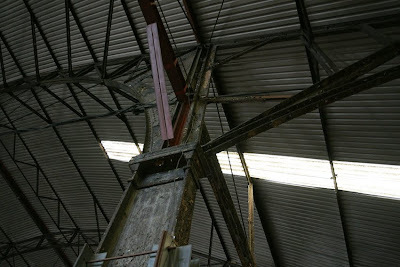 The future of the warehouse is, according to the current plans, as a cultural space. 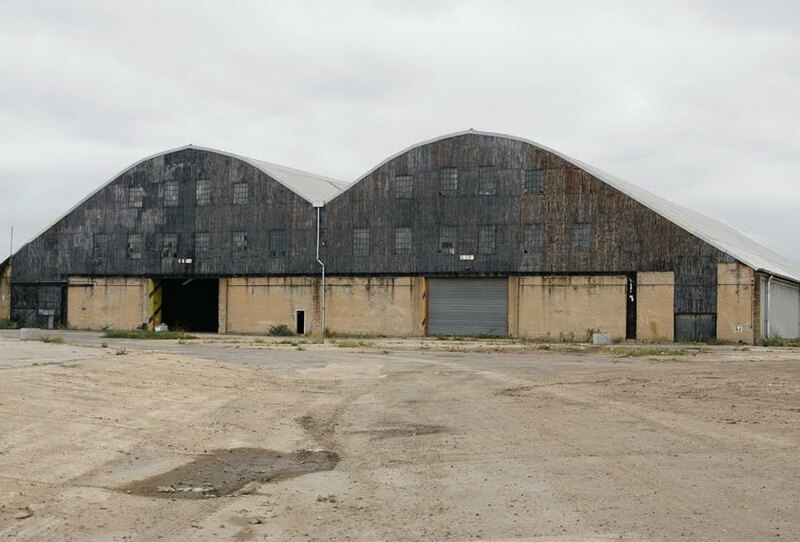 It certainly has a distinctive atmosphere and presence which provide a vital connection to the dockyard's past, and with sensitive use would be a real asset to the area. Thoughtful use and an appropriate setting will be vital, however, for this significant and special piece of Britain's shipbuilding heritage. The starting point of this artwork was to turn the pillars on the wall from obstacles to features, creating a landscape reminiscent of a stonehenge or a set of dominoes. On this old Roman road, the mural is a reminder of time passing and how it changes everything humans build. Unfortunately, the explanation adds to the feeling that this is an opportunity slightly missed. 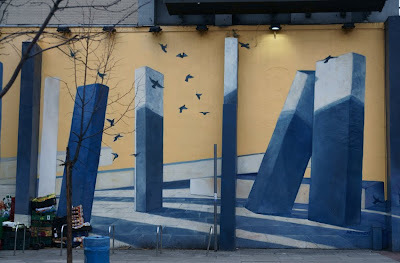 Although the mural is pleasant enough, the trompe l'oeil effect is fun, and I rather like the birds, there is little sense of place. A slight allusion to the Broadway's past as part of a Roman road is not a real engagement with either the history or the cultural diversity of the area. Which raises the question, just how should murals relate to their location? Guides from all four areas are offering free walks this Saturday, with a 'That's Entertainment!' theme. Just turn up on the hour between 10am and 4pm (no need to book) and gain new insight into London on stage and screen. 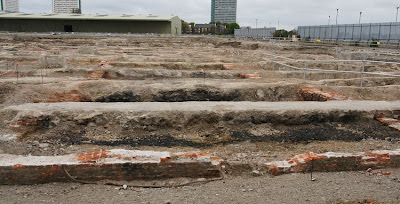 Yesterday, I joined a guided tour of the Convoy's Wharf site led by Museum of London Archaeology. As debate rages over proposed development on the site, it's instructive to realise just how much of Deptford's history is still present here. 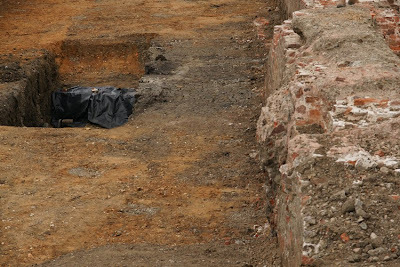 Although key buildings were demolished above-ground, their foundations remain; other important features have always been below ground level and are largely intact. The trading history of Deptford goes back much further than the founding of the Royal Dockyard by Henry VIII. There was probably already trade on this site before the Romans arrived. They certainly used it, and we saw a piece of Samian ware from Gaul found during the excavations. Shipping continued here in the Middle Ages, and the dark area of ground in the photograph below is part of the site of a mediaeveal dock. The mediaeval dock was filled in order for a Tudor storehouse to be built in 1514. Unbelievably, this survived until the 1950s but was demolished in 1954. Some of its bricks were then used for garden walls at Hampton Court Palace. The foundations remain, though, and are clearly visible as a rectangle of salmon-coloured brick. The Tudor great dock is partly intact, although some of the stonework was damaged when World War I warehouses were built here. Various slipways have also survived: the one pictured here dates from the early nineteenth century (slipways were altered and rebuilt on the same sites as the size of ships changed). 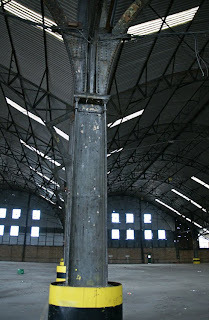 Some of its wood is reused ships' timbers; the uprights are later, and of imported African wood. The slipway is probably the last such London structure of this size still surviving; it is proposed to leave it in situ but cover it up when redevelopment occurs. 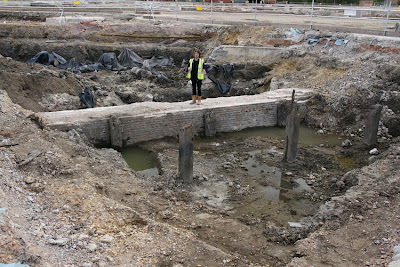 The dockyard also had a huge basin, extending back into much of the current site, and the wall and large upright timbers below were part of it. The basin became smaller and deeper over time, again to accommodate changes in shipping. This tour highlighted both how much of Deptford Dockyard's industrial heritage was lost last century, and how much is still there. The fascination lies in the way it reveals the huge changes and innovations which all occurred here: this is a complex map of naval, industrial and maritime history, rather than a survivor of just one historical moment. It is a great shame that the proposed redevelopment does not take more account of this. However, Lewisham Council have responded to the many objections to the plans by organising a drop-in session from 5-8pm this Tuesday 11 October. It's at St Nicholas Church Hall, Deptford Green and offers an opportunity both to get more information about what is proposed for the site and to make your views known. For more on the Convoy's Wharf development proposals, do follow Deptford Dame and Deptford Is... while Shipwright's Palace has not only information about the issues but also a huge amount of historical information about the dockyard. As long-standing readers may have realised, I have a fondness for ventilation pipes. Some are rather elaborate, such as the listed example in New Cross; by contrast, the sewer stink pipe is usually more unassuming. These pipes were designed to allow gas to escape the sewers and disperse high above our heads. It's a vital function, but not a glamorous one. Easily mistaken for lamp posts when they're noticed at all, the stinkpipe can seem the poor relation among street furniture. However, they are often worth a little attention and I've featured one of these Victorian gems from Deptford. 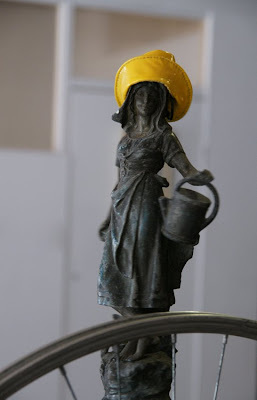 New blog London Stinkpipes has gone further and aims to map examples from all over South London. You can also follow on Twitter. As the new mural in Douglas Square takes shape, here's a look back at what preceded it. 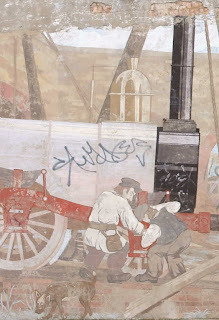 Images of Deptford in 1840 covered the wall: a little faded, a little graffitied and a little unfashionable, but I was rather fond of it. The railway theme was absolutely right for the location, given Deptford's importance in passenger railway history. It was created by Christopher Ryland (now better known as a botanical artist) and Paul Pestidge in 1981. Its thirty-year lifespan contrasts sharply with the three years intended for its replacement. 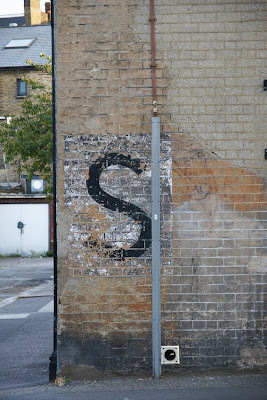 Ghost signs have been popping up regularly on the blog for as long as I've been writing it. Sixty-five posts and three years later, it seemed a good time to give them their own page, too. Here it is! As well as an overview, background and further reading, the page lists signs by location and product type. It's something of a work in progress - in particular, I need to break down 'London' into smaller areas. I welcome any feedback! Brightly-coloured, hand-painted signs have been appearing around Deptford and New Cross, thanks to the Talking Walls project. 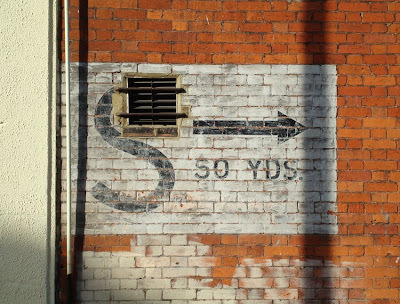 Although they don't explicitly mention ghost signs, those involved say that they are "really inspired by the charm of traditional advertisements, half faded but still visible to the curious eye" and "aim to commemorate and preserve the dying industry of hand rendered sign writing". 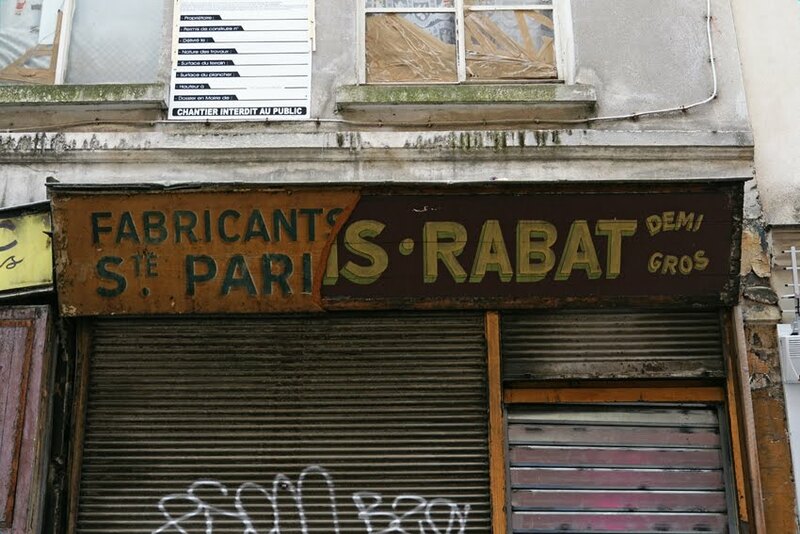 There is, of course, local ghost-sign inspiration for such an exercise. The project was founded by Tessa Lawer, now working with Thomas Marriott. 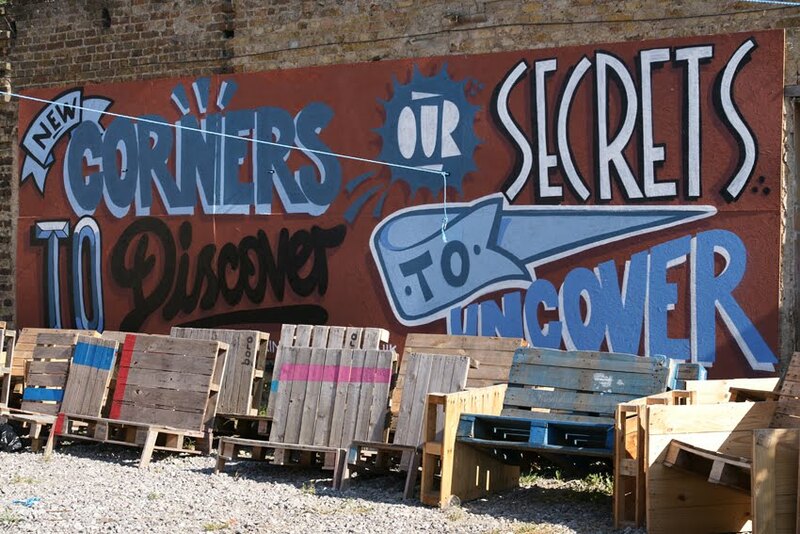 There are signs at Goldsmiths College, the Albany and Deptford Project - each by a different artist - and the website seems to promise more to come. 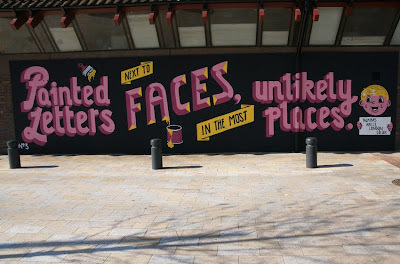 Let's hope so, it's lovely to see this contemporary take on one of my favourite features of the urban landscape! Deptford's annual art festival enjoyed unseasonably hot weather today, and I did rather wilt as a result! However, between lurking in the shade and drinking cool drinks, I found plenty of artistic activity. The new mural in Douglas Square is progressing well. 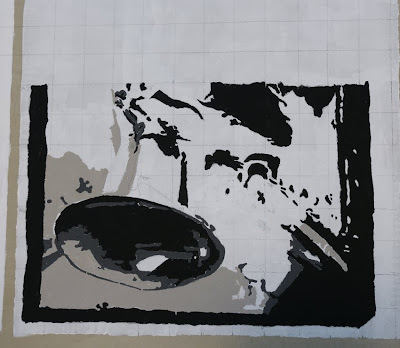 While some panels are finished, one is currently being worked on. It's interesting to get a glimpse of how the artist Peter Anderson is converting photographs into wall paintings. 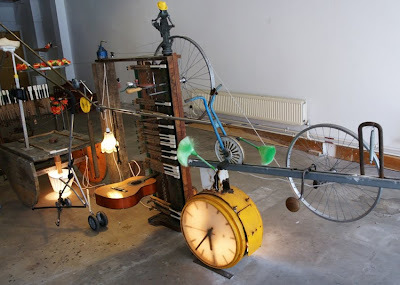 Back inside, the cool and shady Utrophia space was filled with Ben Parry's Deptford Machine. Its clanking sounds and slow, complex movements were rhythmic and soothing: an unusual and restful contrast to the lively market just outside. 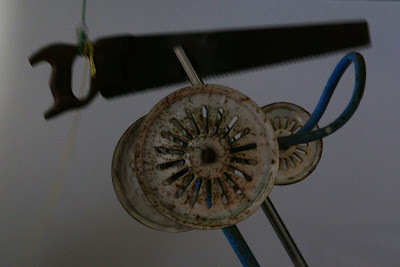 Photographs can't do justice to the movement of the piece, so do take a look at the video on Crosswhatfields? as well. Many galleries are open for the weekend, and there was plenty to see on Creekside in particular. 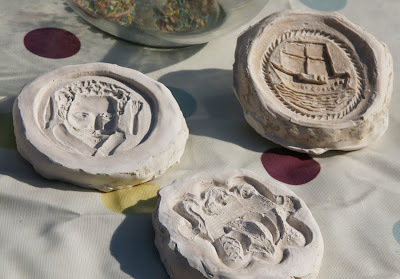 Soon, though, I was outdoors again for the 'make and bake' session held by The Deptford Biscuit. Presumably sitting in the sunshine wasn't the original plan for an October event! 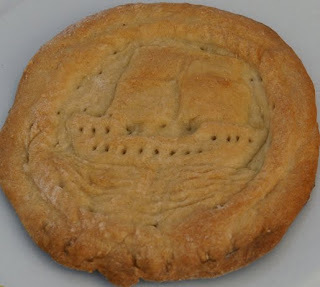 These wonderful ship's biscuits are very appropriate for a Deptford festival. Not only were such biscuits manufactured here, but the designs added by artists Bridgette Ashton and Nicole Mollett tell the story of the Golden Hind. 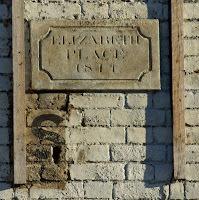 At the end of its journey, it moored at Deptford where Sir Francis Drake was knighted by Elizabeth I. After many years as a tourist attraction, the ship decayed and its timbers were converted into souvenir items including a chair. 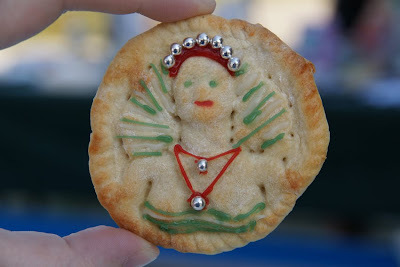 These events are depicted on the biscuits. At today's session, we decorated the biscuits. What my effort lacks in artistry is compensated for by the pleasure I had doing it!